Congratulations to Senior Line Backer, Matthew Hernandez, on his commitment to Bethany College. Matt earned a Football Scholarship and will continue to grow academically and athletically as he makes his way to Lindsborg, Kansas to join the Bethany Swedes this fall. Matthew was a Senior Captain who led our team in tackles and sacks this past season. His motor and tenacious attitude help lead our defense this year and will be a key reason why he makes an impact at Bethany. 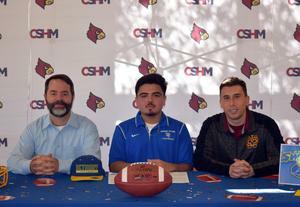 All coaches, staff, and admin at Cantwell Sacred Heart of Mary are extremely proud of Matt and excited for the next four years.